Discovered before 1654 by Giovanni Batista Hodierna. Open cluster Messier 47 (M47, NGC 2422) is a coarse, bright cluster which can be glimpsed with the naked eye under good conditions as a dim nebulosity. M47 was discovered before 1654 by Hodierna who described it as "a Nebulosa between the two dogs"; this fact, however, remained secret until 1984 when his book came to light. So Charles Messier discovered this cluster independently on February 19, 1771, and described it as cluster of stars brighter than those of apparently neighbored M46. But Messier did a sign error when computing the position of M47, so that it was a missing object until 1959 when it was identified by T.F. Morris (together with the also missing M48). It is interesting that despite Messier's error, Caroline Herschel observed and identified M47 at least twice in early 1783. 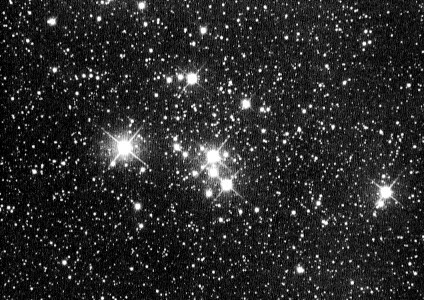 Several historians have reported that M47 had been previously identified by Oswald Thomas in 1934, but this is apparently a confusion with that author's identification of M48. As a consequence of Messier's error, William Herschel also independently rediscovered it on February 4, 1785, and gave it the number H VIII.38. Messier's erroneous position was also surviving in many catalogs, including John Herschel's GC (as GC 1594) and Dreyer's NGC (NGC 2478), although there was no object, or as John Herschel (in his Notes on the GC) put it, "This cluster has not since been observed. It is probably a very loose and poor one." Open cluster M47 is a coarse cluster of bright stars, and contains about 50 stars in a region 12 light years in diameter; in the central portion, the stellar density is about 16 stars per cubic parsec while the average density of the whole cluster is only 0.62 stars per cubic parsec, according to Wallenquist (as quoted by Kenneth Glyn Jones). Its distance is about 1,600 light years (values scatter from 1,560 to 1,750 light years), so that the stars of M47 appear scattered over an area in the sky of the same size as the full moon, 30 arc minutes. The cluster's Trumpler type is given discordantly as II,3,m (Glyn Jones), I,3,m (Götz), and III,2,m (Sky Catalog 2000). The brightest star is of spectral class B2 and mag 5.7, the overall population resembles that of the Pleiades. It also contains two orange K giants with luminosity of about 200 times that of the Sun each. The Sky Catalog 2000 gives an estimated age of 78 million years for this stellar swarm which is receding from us at 9 km/sec. The bright star nearest to the center of our photo is the fine double Sigma 1121, with components of mag 7.9 both and separated by 7.4 arc seconds.